One of golf’s highlight events is set to take place this week as the sport’s top competitors meet in Paris, France, to vie for the Ryder Cup. For full coverage, visit RyderCup.com. While the Americans battle it out with Team Europe at Le Golf National this weekend, we’re taking a look at how these golf greats fared before the tour. Captaining Team America is former Wildcat Jim Furyk. Furyk received All-Pac-10 honors in 1989 and 1990, and was a senior member of the 1992 NCAA national championship team. During that season he averaged 73.53 for 39 rounds, earned seven top-10 finishes and was named an All-American. David Duval was named Player of the Year and a first-team All-American from 1990-1993. He still holds the Georgia Tech record for career victories with eight total (six regular season and two post season wins), and is the only Yellow Jacket to win the ACC title twice (in ‘91 and ‘93). Coming to Atlanta a few years after Duval was Kuchar, who earned first-team All-American honors in 1998 and 2000, as well as the title of National Player of the Year in 2000. His standout freshman season garnered him the ACC Rookie of the Year award in 1997 and he followed that up with the ACC Player of Year in 1998. As the #2 ranked player on his team, Zach Johnson led the Bulldogs to three NCAA regional meets and two Missouri Valley championships during his time at Drake University. Over four years at UNC, Love earned All-America and All-ACC honors three times, led his team to ACC titles in 1983 and 1984 and captured the ACC Individual championship in 1984 at the famed Pinehurst No. 2. A three-time All-American, three-time Big Ten champion and two-time Big Ten Player of the Year, Stricker led the Fighting Illini to a 1988 Big Ten Championship. The three-time Ryder Cup contender holds 12 individual tournament titles at Illinois, leading his team to 11 first-place finishes and 10 second-place finishes in his 49 career tournaments. He still holds the Illinois record for lowest 72-hole score (273). Before making headlines with back-to-back wins to start the 2018 FedEx Cup Playoffs, Dechambeau was making waves in the collegiate golf sphere. He became just the fifth player in history to win the NCAA Division I individual title and the U.S. Amateur Championship in the same year. His individual win helped SMU to become the NCAA National Champion in 2015 as well, a first for SMU men’s golf. Rickie only spent two years at OSU before turning pro, but accomplished a lot during that time. In that span he was named a two-time All-American, earned the Phil Mickelson award as the nation’s top freshman and was the first freshman to be awarded the Ben Hogan award (given to the top college golf player by the GCAA). With nine consecutive top-10 finishes to start his career he led his team to the 2008 Big 12 Conference Championship as well as earning the 2008 Big 12 Individual Conference Champion, Big 12 Newcomer of the Year and Big 12 Player of the Year awards. Dustin Johnson had a standout career at Coastal Carolina, leading CCU to its first-ever berth in the NCAA Championships in 2005, a second straight berth in 2006 and then a 5th place finish at the 2007 NCAA National Championship. His personal accolades include being named a three-time All-American and Player of the Year finalist, a three-time Big South Golfer of the Year, and the 2005 NCAA East Region Champion. Koepka was named ACC Freshman of the Year in 2009 and then proceeded to be named to the All-ACC team from 2010-2011 as well as garner the ACC Player of the Year award in 2010 and 2012. The man, the Mick, the legend, won back-to-back individual NCAA championships (one of seven players to do so) and was the second player to win three NCAA individual titles in his collegiate career (as a freshman, sophomore and senior). Mickelson was a four-time first-team All-American, a 16-time tournament winner, three-time Pac-10 Player of the Year and just the second golfer to win both the U.S. Amateur and NCAA individual title in same year (and the first lefty to do so). After a short stint at the University of Georgia, Reed led Augusta State to team NCAA championships in 2010 and 2011. He was a two-time All-American, the 2011 NCAA Southeast Regional champion and still holds the ASU record for individual low career average at 71.33. Simpson was named ACC Freshman of the Year in 2005 and was named to the All-ACC team three times after that. He helped lead Wake Forest to the 2005 NCAA East Regional Championship and was key in the Deacons’ run to a third-place finish at the NCAA Championship that year, as well as in two more appearances at the NCAA Championship. 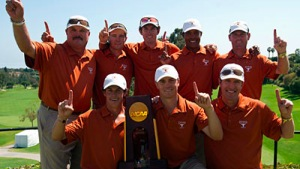 In just a season and a half with the Longhorns Spieth earned three individual medalist honors, was named a first-team All-American and, as a freshman, led Texas to eight regular season tournament wins along with securing the 2012 NCAA team championship title, its first in nearly 40 years. Justin Thomas helped the Tide roll to the school’s first NCAA team championship title in 2013. The National Player of the Year and National Freshman of the Year led his team to a school record for victories in a season (eight wins out of 12 tournaments) and earned a school-record four medalist honors, including victories at the 2012 SEC Championship and the NCAA Athens Regional. He was the consensus National Collegiate Player of the Year, honored with the Jack Nicklaus, Fred Haskins and Phil Mickelson awards. Bubba Watson played two season for UGA before turning pro. In that time he was named an honorable mention All-American, second-team All-SEC and helped lead the Bulldogs to the 2000 SEC title. Already a golf stand out before stepping foot on a college campus, Woods needed just two years to leave a tremendous impact on collegiate golf and Stanford. He was a recipient of the Jack Nicklaus National Player of the Year award, the Haskins Award and the Ben Hogan award. The GOAT, as some will say, was a two-time Pac-10 player of the year, a two-time first-team All-Pac-10, and was the Individual Pac-10 Champion in 1996. 1996 also marked Woods’ NCAA Individual Championship title and a fourth place finish for Stanford. He is an 11-time tournament winner for Stanford, holds the single-season wins record for the Cardinal and tied for first in career wins despite only having played in 26 tournaments during his time there. Also of note — the alumni of the Stanford men’s golf program have won a combined 29 championships at the four major golf championships, U.S. Amateur and British Amateur. Tiger is responsible for 17 of those victories.